Puppis A is a remnant of a supernova explosion whose light reached us about 3,700 years ago, is 100 light years across, and is about 7,000 light years away in the southern constellation of Puppis. It is one of the most well-studied X-Ray objects in the sky. 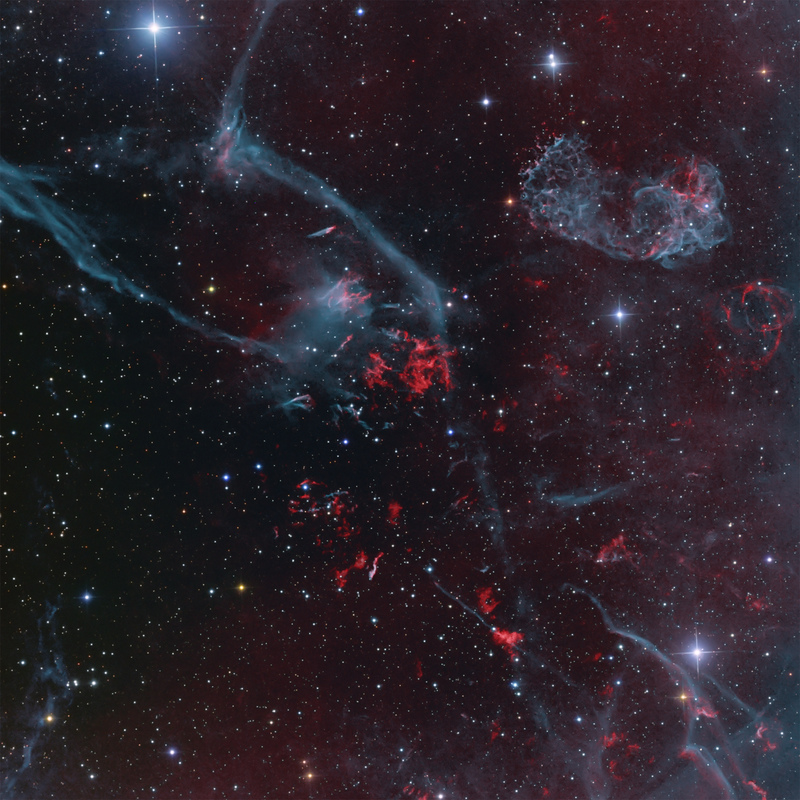 It is superimposed over the signal of the more ancient Vela supernova remnant that occurred 12,000 years ago, but is four times closer to us than Puppis A. The most detailed X-Ray image taken in 2013 from the Chandra and XMM Newton data can be found here (http://chandra.harvard.edu/photo/2014/puppisa/ ). The complex appearance of the image above� suggests that the shock wave from Puppis A explosion raced through a non-uniform interstellar medium. This is a deep narrowband image using H-a + [NII] mapped to red and OIII mapped to blue/green.� Star colors were added with shorter RGB data.� The image is filled with a variety of objects and elongated tendrils, showing the complexity of this region. Signal contours for X-Ray (C. Goudis and J. Meaburn, �An Accurate Optical and Radio Comparison for the Puppis A Supernova Remnant�, Astron. Astrophys. 62, 283-285, 1978) and radio (R. Petre et al. �A High-Resolution X-Ray image of Puppis A: Inhomogeneities in the Interstellar Medium, Astron. J. 258, 22-30, July 1, 1982) data adapted from these technical references are superimposed upon my image below. The white contours are for the X-Ray data and green for radio data.� The ‘X’ represents the centroid of the radio data. � As the authors indicated, there are regions where the contours correspond to the brighter optical emissions, but there are also regions that do not. Jaw dropping image – I have not seen anything like it before! Thanks, Tim. There are so many things going on here that I had difficulty framing it to focus the eye. Maybe that’s the point. Supernovas are messy business! Lots of obscure and unphotographed nebulae in the southern celestial hemisphere are like nothing you’ve ever seen before! What I really like about this particular one is that you really get the impression of a star exploding. Awsome picture!! Congratulations on getting this one to another APOD (yesterday)!! The fact that you did not use SII images, is it due to the spectrum being weak in this area or to get more “natural” colors? I really didn’t try SII to go for the Hubble Palette look. I wanted it to be “natural”, like my planetary nebula. Thanks, Josep.